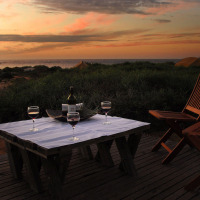 Experience 'barefoot luxury' in Western Australia's Cape Range National Park, on the shores of World Heritage Ningaloo Reef, an extraordinary yet little-known jewel in Australia's natural heritage. Between April and July Ningaloo is home to Whale Sharks and it has been acknowledged as the best place in the world to swim with these slow-moving, gentle giants. In addition to these incredible creatures, the reef abounds with an array of sea life including dugongs, loggerhead, green and hawksbill turtles, manta rays and large game fish such as sailfish and marlin. Humpback whales also migrate through the area twice annually and there is now the unique opportunity to swim with these majestic creatures between August and October. 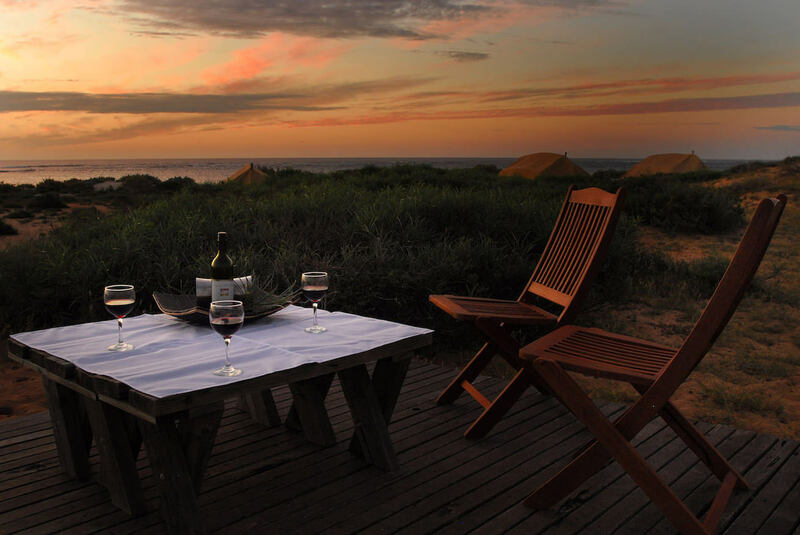 On land, the Cape Range National Park offers excellent wildlife and birdlife viewing including Red kangaroos, wallaroos, rock wallabies and Gould’s goannas. For the seasoned birders, fairy wrens, zebra finches, honeyeaters, reef herons and ospreys can all be found either in or close to the camp. Expert guides are on hand to provide authentic wilderness experiences including snorkelling, kayaking, guided walks and game fishing. A delicious, seasonal menu featuring fresh local produce is prepared by the resident chef, accompanied by fine Western Australian wines. 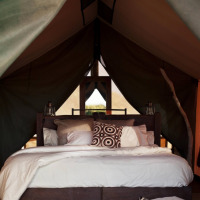 At the end of your day's adventures, retreat to your spacious wilderness tent and sleep soundly on a comfortable bed. 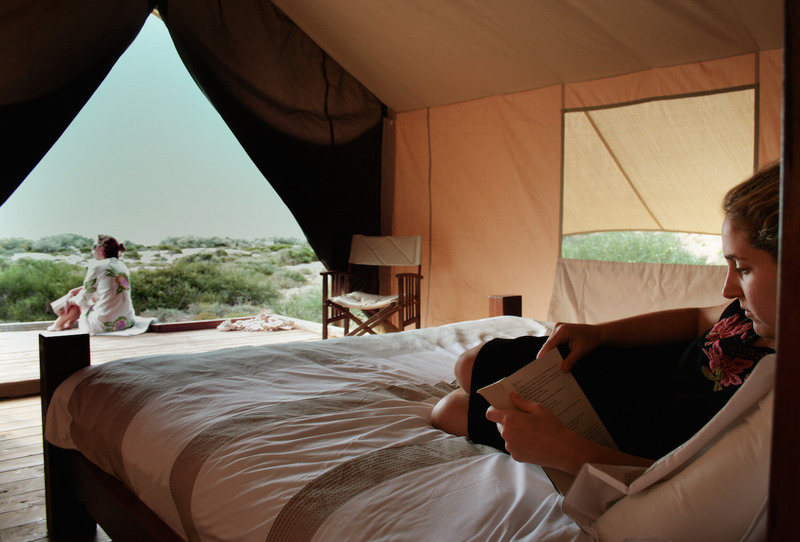 Accommodation at Sal Salis consists of 16 spacious wilderness tents, designed to blend harmoniously into the surrounding environment. 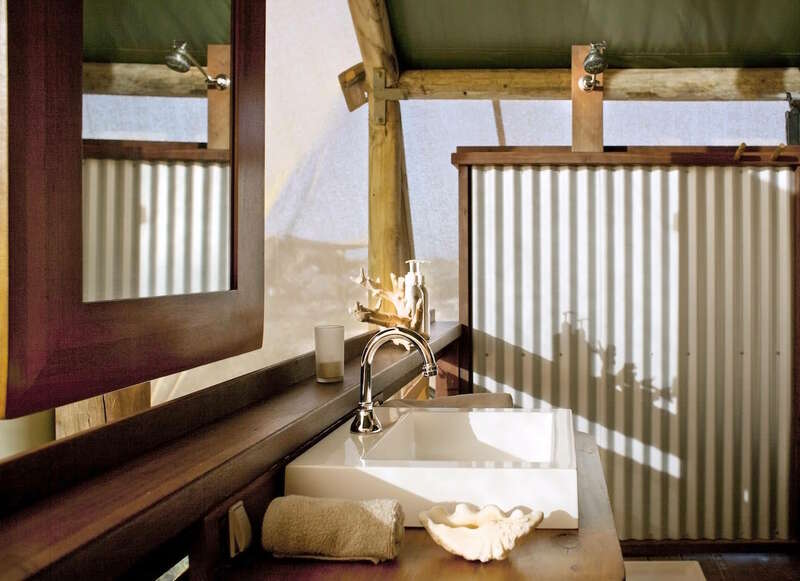 The tents are set on raised timber platforms, facing the sea, allowing the sea breeze to naturally cool the rooms. 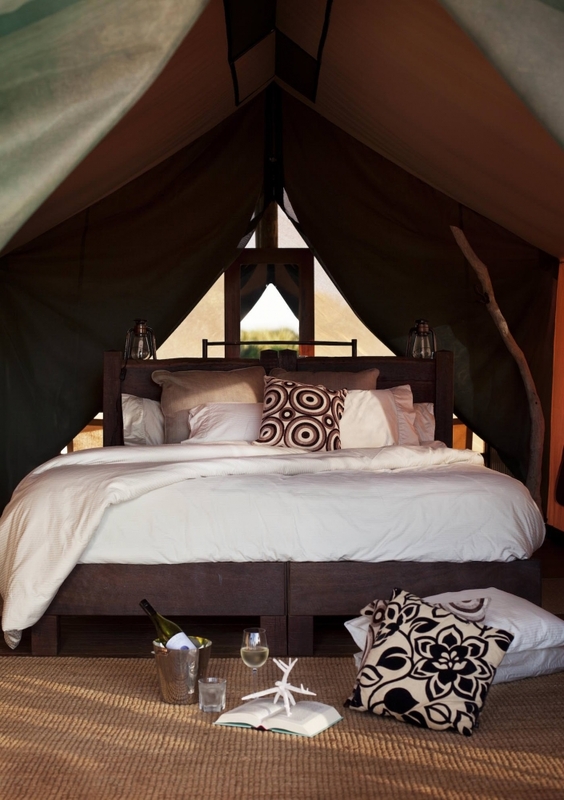 Sleep comfortably on handmade jarrah beds, fitted with 100% organic cotton sheets and a choice of pillows. 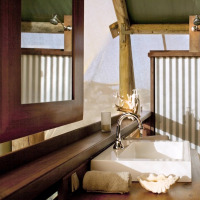 The eco ensuite bathrooms include solar heated showers and composting toilet. 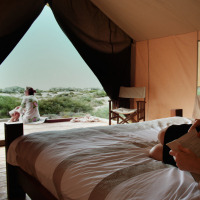 There is no television, mobile phone signal or WiFi, so you are truly able to unwind and connect with your natural surroundings. At the main lodge, there is a comfortable lounge area with self-service bar and a small library with a range of books and board games. The main lodge is also where delicious meals are enjoyed with your fellow guests and guides, followed perhaps by a spot of star gazing. One thing Sal Salis is renowned for is the opportunity to swim with whale sharks (April to July). As of 2016, between August and October, guests will also be able to swim with Humpback Whales. Both of these are once in a lifetime experiences which can only be done in a very limited number of places in the world. There are a host of other daily guided wilderness activities, including guided gorge walks, kayaks and snorkels. Fishing Safaris are also available (additional cost) and offer the opportunity to hook a variety of game fish such as Black, Blue and Striped Marlin, Spanish Mackerel, Mahi Mahi, Giant Trevally, Wahoo and Sailfish. There is also Reef Fishing, with Coral Trout, Red Emperor, North West Snapper and Groper among the prize catches. Fly fishing for Bonefish and Permit is also a possibility outside the National Park, though fly fishers will need to bring their own gear. Note that Sal Salis is committed to the sustainable practise of catch and release fishing. The resident chef at Sal Salis creates a delicious, contemporary menu with hints of 'bush food', using local and seasonal produce and of course, local, fresh fish. Western Australian wines are also on the menu, along with other regional wines, beers, spirits, soft drinks and juices. Meals are served at the lodge or on the deck and are shared with your fellow guests. For special occasions, there is also the option of a private beach dinner (additional cost applies). Sal Salis operates from mid March until the end of October each year. If you are looking to swim with the whale sharks then April to July is the time to visit and from August to October there is also the opportunity to swim with humpback whales. Below is a guide on what's happening in regards to weather and wildlife throughout the year. Autumn (March – May): Sal Salis opens mid March after the hottest of the summer weather is over. Days are still quite warm (high 20's to mid 30's Celsius) with mild mornings and evenings, starting to get a bit cooler later in the season. April is the beginning of the season for swimming with the whale sharks, and at this time of year the water is at its warmest. Winter (June – August): Lovely warm days (mid 20's Celsius) with cooler evenings. In addition to the whale sharks which are still around, there are also manta rays offshore, and humpback whales are regularly sighted. Spring (September – November): Daytime temperatures start heating up again (high 20's to mid 30's Celsius), though there is a cool sea breeze and evenings are still cool. The humpback whales begin migrating south and from late October the turtles begin their nesting season. Summer (December – February): Sal Salis is closed over this period when temperatures reach into the high 30's Celsius, with occasional cyclonic conditions off-shore. This is the time when the first turtle hatchlings make their way to the ocean. The closest airport to Sal Salis is Exmouth Learmonth Airport. Qantas operates daily flights from Perth to Exmouth. From here you may choose to take a shared road transfer (90 minutes) or a private scenic flight (30 minutes), both are additional costs.